Locate the problematic file on your computer. In the Properties dialog box, look for an Unblock button near the bottom right. If it exists, click Unblock, then click Apply, and then click OK to dismiss the dialog box. Now, attempt to open the presentation again. Right-click the file in File Explorer and select Open. If you're having a problem with PowerPoint that's not resolved here, please contact us for technical support. 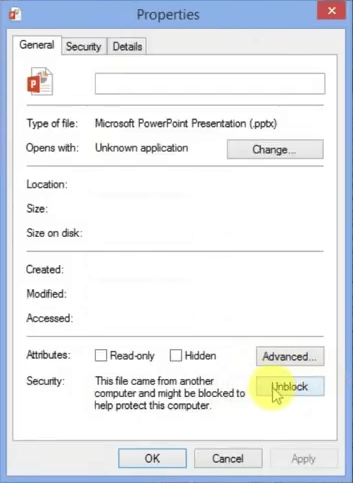 For a discussion about why Office blocks files, read Block or unblock external content in Office documents.